The 71st General Assembly of the United Nations kicked off last week in New York at a time when the institution receives generally positive ratings from a diverse group of its constituent countries, according to our spring 2016 Global Attitudes Survey. Overall, majorities or pluralities have a positive view of the UN in 17 of the 19 countries surveyed. Positive opinions range from a high of 82% in Sweden to 40% in India (where 43% of the public has no opinion of the UN). Greece is the only country surveyed that has, on balance, a negative view of the international organization (53% unfavorable). But significant numbers – though minorities – of the Spanish (37%) and Japanese (34%) also hold unfavorable views of the UN in 2016. Pew Research Center has been asking about global views of the UN for roughly a decade. In that time, there has been some year-to-year variation in each country on their respective views of the worldwide body, but not much overall movement. For example, favorable opinions of the UN jumped in Japan in the aftermath of the 2011 tsunami, but are now back to levels seen in 2007. And in China, opinions of the UN lagged from 2011 to 2013, but are now up near their all-time high (55% in 2009). European attitudes have remained basically steady during this time period. 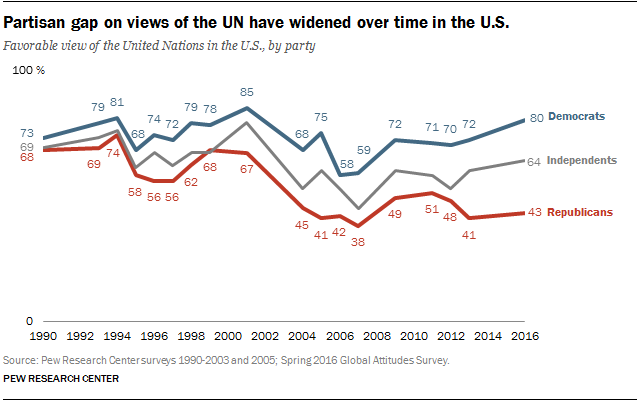 In the U.S., there has been a more dramatic rise in positive views of the UN over the past decade. 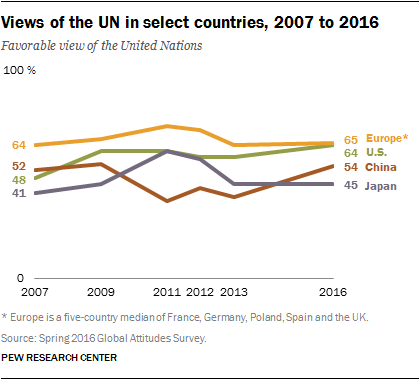 In 2007, 48% of Americans had a favorable view of the UN, but that figure has since climbed to 64% as of spring 2016. Using data from domestic Pew Research Center surveys prior to 2007, we can look at the changing partisan divide in the U.S. back to 1990. When this question was first posed in 1990, seven-in-ten Americans viewed the UN favorably and the partisan divide was minimal. Nearly equal numbers of Democrats (73%) and Republicans (68%) shared a positive view of the UN. There was a dip in favorability in the late ’90s (possibly on account of the troubled UN peacekeeping mission to Bosnia and Herzegovina), but overall views of the international organization were positive among both Democrats and Republicans through 2001, before 9/11. However, by 2004, following the start of the Iraq War in 2003, views of the UN among Republicans had plummeted below 50% and have not recovered, while attitudes among Democrats dropped somewhat – particularly in 2006 and 2007 – but rose through the Obama era. Consequently, the current U.S. partisan divide on favorable views of the UN (a 37-percentage-point difference between Democrats and Republicans) is the largest we have measured. International views of the UN are tied to people’s views about their country’s role in the world. People who say their country should help other countries deal with their problems are more likely to have a favorable view of the UN than those who say their country should deal with its own problems. In other words, in many of the countries surveyed, higher internationalist sentiment corresponds to more positive views of the UN. For example, 81% in the UK who say their country should help other countries have a favorable view of the UN, compared with only 57% favorability toward the UN from those who prefer that the UK deal with its own problems. Similar large gaps also appear in Germany (21 points) and Australia (20 points).